The history of the car is completely unknown as the person I got it from had received it from his father who pulled it from a different field decades before in Kansas. If you got the v12 with the car that is the engine that was in it when it was pulled from the field. However it had the rarer steel nickel heads and a dual Zephyr carb intake. When I sold it to the buyer I sold him 2 v12s, one the original and the other out of a car for spare parts. The intake was Edelbrock brand and can be found on the market. 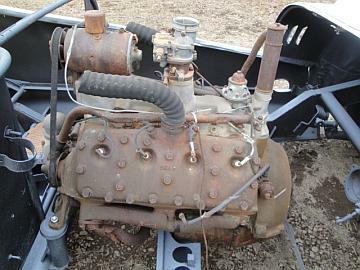 The dual master cylinders hopefully are still on it and the lines that ran the inside of the frame rails and as you know the original radiator lines x4 ran the outer wells. We never found the gear box and assumed and early ford style ZF with one of the master cylinders going to it(s) shift-er. Dumb luck the rear shortened drive shaft housing was still there. There was lots of lead filling in above the brazing that shaped the body in nice smooth lines, there we no seams to be seen. Louvers are original, we could tell from the erosion matching the body when we stripped it. The original wheel found with it had small “louvers” welded around the outer rim (not out edge) which would have been for cooling, I hope you got it. All parts we could identify were from 39 to 41 and the frame numbers matched front and rear so even though it was shortened it still had original matched framing. I used to design modern cars and was an automobile writer and can tell you it definitely was not made in just anyone’s shop, it had to had some money behind the project. The wrapped transverse springs with zerts combined with corner springs was ahead of its time as well as multiple slave cylinders and true mid engine setup. Original color was red then blue, I don’t know if it was completely erased but you can find some of the original paint in the rear where the spare was made to go. Seat base/back and interior were all built upon wood. Front fenders had been torn off and it had 40 or 41 full fenders with inset headlights when built but unsure of what was between them for a grille. I am happy it went to someone that is going to do something proper with it. Engine cover was from what we could tell was hinged in the center and an opening for the carbs. Exhaust out the sides of course. Oh almost forgot, it did have rear fender skirts when built, we found one laying inside the shell in the mud and found it fitted nicely. But it was rusted beyond repair and edging was ruined. I would appreciate you letting me know how it goes along in getting it back together and if you plan on getting rid of it possibly considering me as a buyer. Do you still have the engine and gearbox ? You said you pulled it out of a field, do you know of any ghost tracks around that location? After looking at various pictures from old SCCA magazines from 1948 to 1955, I am convinced that it was part of the SCCA road racing class. Is there anything else you can tell me about the car? Did you speak to locals about it? I will of course share the restoration pictures with you as and when we start. 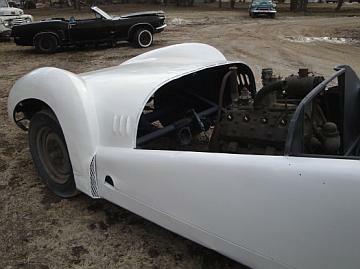 The project has only just started and we are looking for support to rebuild this lost racing car. The aim of the project is to research the history of the car and bring it back to its former glory. The car originally came with a Lincoln Zephyr V12 engine and was ahead of its time with its rear engine mounting. It was a great disappointment to find that the car did not come with the original engine which is a great shame, but we are hot on the trail at this time to see if we can find it. Ford Flathead V8 test mount. We are looking for main sponsors or individuals to support the project, we intend to promote the project via Kickstarter at the appropriate time. Do you have parts you can donate? Let us know. Copyright © 2019 The Lost Lincoln Zephyr Special All Rights Reserved.